Are missions to the Moon and Mars feasible? NASA's human spaceflight program is stuck in low orbit, held back by budget constraints, political bickering, competing visions and daunting technical challenges. 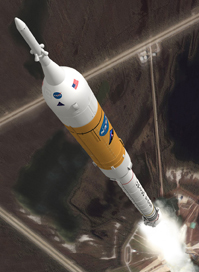 A White House-commissioned panel has warned that the program is on an “unsustainable trajectory” because of funding limitations, and plans to build a new generation of rockets, return to the Moon and eventually go to Mars are under intense scrutiny. Meanwhile, the impending termination of the Space Shuttle could leave a seven-year gap during which the United States could have to rely on Russia to ferry astronauts to space. The future of NASA's human spaceflight program — including whether to build a lunar settlement — rests heavily on whether the Obama administration presses for more space funding. Meanwhile, private companies are working to build rockets of their own. Entrepreneurs hope to transport not only cargo into space but astronauts too. At the same time, private operators are gearing up for an emerging business taking wealthy space tourists into orbit.